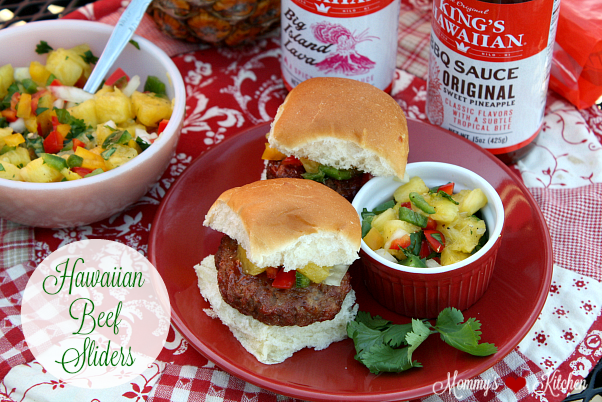 Sweet and savory Mini Hawaiian Beef Sliders with Pineapple-Mango Salsa, using King's Hawaiian® products. Happy Tuesday everyone!! It's Fall in Texas which means crisp fall weather, the changing of the leaves, comfy boots and sweaters, pumpkin everything and football!!!! Today I'm sharing these easy game day inspired Hawaiian Beef Sliders perfect to kick off Football season. When it comes to tailgating and football food I always try to keep it simple. I usually lean towards simple dishes and finger foods that transport easily. Let's face it folks they won't be eating in the dining room, so finger foods and easy to carry items are a must. Are you a fan of King's Hawaiian bread and rolls? My family loves them!!!! Their bread is a favorite in our house and makes the best French Toast. We also love the Hawaiian roll ham and cheese sliders which are perfect for get together's and tailgating. Nothing says barbecue Hawaiian-style like the pairing of a sweet pineapple barbecue sauce, King's Hawaiian rolls and a colorful fruit salsa. 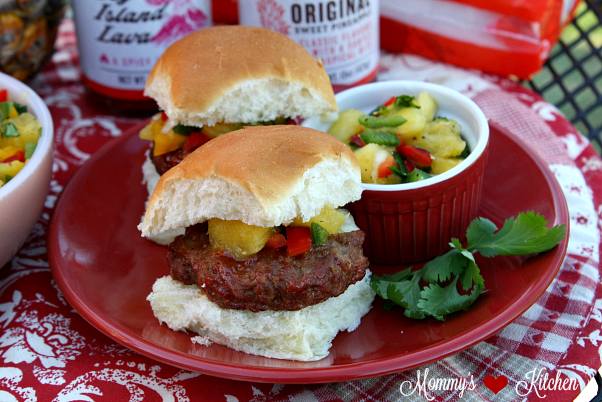 These little beef sliders are perfect on their own smothered in King's Hawaiians Sweet Pineapple BBQ Sauce (the way my kids like it) or topped with a delicious Pineapple-Mango Salsa (the way I like it). 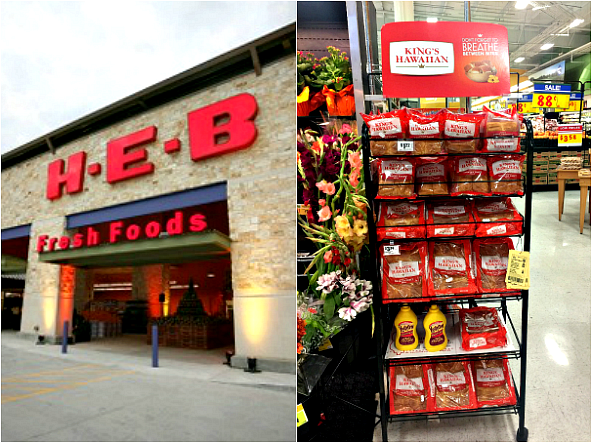 Sunday was game day, so I headed to my local HEB store to gather all my items. 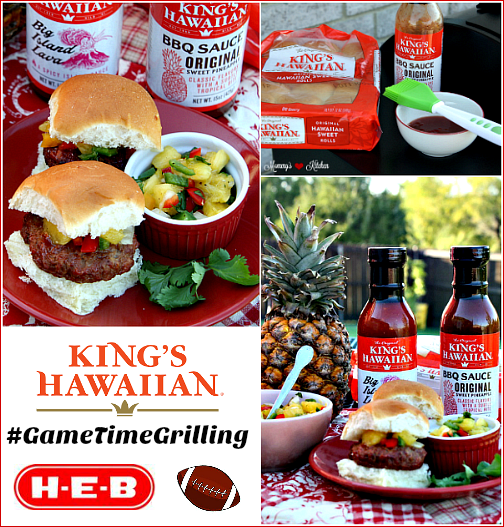 HEB offers all my favorite King's Hawaiian® products, original, savory butter and jalapeno sweet rolls, loaf bread, hamburger and hot dog buns, as well as their new line of barbecue sauces. I used the Sweet Pineapple Barbecue Sauce and the original sweet rolls to make the beef sliders, but I also grabbed a couple bottles of the big island lava sauce which I plan on using for another meal. These tasty beef sliders can be made on your outdoor grill or in your kitchen using a grill pan. Now let's get started on the recipe. First, prepare the pineapple-mango salsa a couple hours in advance so the flavors have time to set. Preheat your outdoor grill before assembling the beef patties. Lay a sheet of aluminum foil on the grill or just lightly oil the grill grates. Place 1 1/2 pounds of ground beef in a medium size bowl. Add one beaten egg, bread crumbs, salt and pepper, and 1/4 cup of King's Hawaiian Sweet Pineapple BBQ Sauce. Gently mix using a spatula until combined. Shape into small patties (make them small enough to fit on the King's Hawaiian rolls). Make a small indention or hole in the middle of each patty (to prevent shrinkage while grilling). Place the patties on the grill and grill for 5 minutes or until you get a good sear, then flip the patties over and cook an additional 5 -7 minutes or until cooked through. Brush additional sweet pineapple barbecue sauce on each side as the patties as they cook. Split the Hawaiian rolls in half, using a bread knife, wrap them in aluminum foil and warm the rolls. I used our grills warmer box, but you can also warm the rolls in the oven. When the patties are cooked through, remove and add to a serving plate. Add one slider patty to each roll, top with pineapple-mango salsa and additional sweet pineapple barbecue sauce and enjoy! 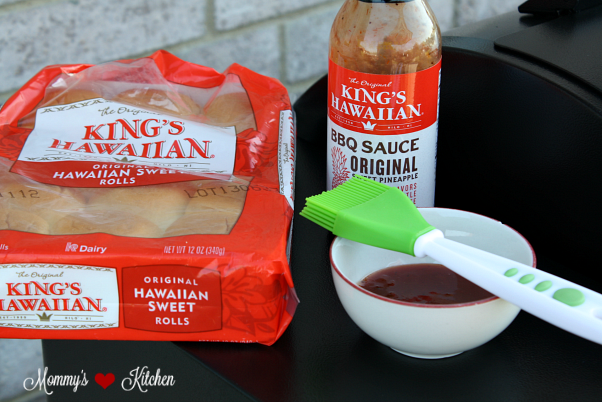 If you want to heat things up a bit, try the Big Island Sweet and Spicy Lava Sauce and serve your sliders on King's Hawaiians Sweet Jalapeno Rolls. 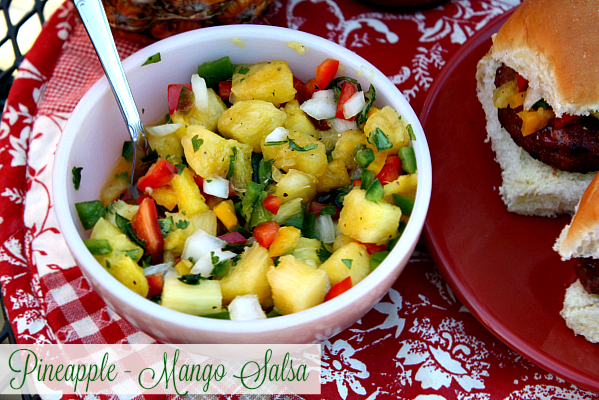 Prepare the pineapple-mango salsa a couple hours in advance so the flavors have time to set. Preheat your outdoor grill before assembling the beef patties (you can also use an indoor grill pan). Lay a sheet of aluminum foil on the grill or just lightly oil the grill grates. Place 1 1/2 pounds of ground beef in a medium size bowl. Add one beaten egg, bread crumbs, salt and pepper, and 1/4 cup of King's Hawaiian Sweet Pineapple BBQ Sauce. Gently mix using a spatula until combined. Shape into small patties (make them small enough to fit on the King's Hawaiian rolls). Make a small indention or hole in the middle of each patty (to prevent shrinkage while grilling). Place the patties on the grill and grill for 5 minutes or until you get a good sear, then flip the patties over and cook an additional 5 -7 minutes or until the patties are cooked through. Brush additional sweet pineapple barbecue sauce on each side as the patties cook. Split the Hawaiian rolls in half, using a bread knife, wrap them in aluminum foil and warm the rolls in the oven. When the patties are cooked through, remove and add to a serving plate. Add one slider patty to each roll and top with pineapple-mango salsa and additional sweet pineapple barbecue sauce. 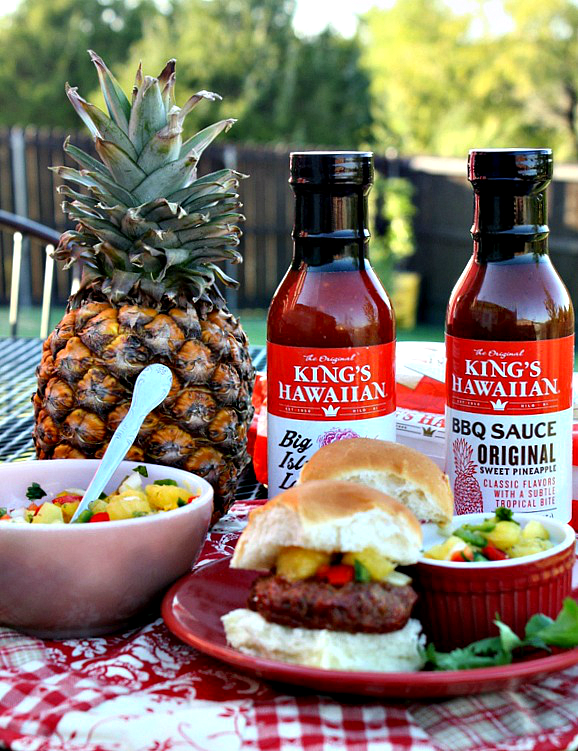 King's Hawaiian Barbecue Sauces are available at select retailers, but can be ordered online at Kings Hawaiian.com or HEB Grocery. Use coupon code (HEB4ME) to receive free shipping on your first order when you register at HEB. I am so glad to find your kitchen. There are many fantastic recipes indeed. I particularly like this recipe because I love pineapple. I will try it for our next family party. I am sure I will come back to visit your site often to get more ideas of good dishes! King's Hawaiian rolls are a staple in our house! I've never heard of the BBQ sauce but i will definitely check them out! BBQ is big at our house especially when the weather is gorgeous! Oh my goodness these look amazing! I can't believe it's already grilling season. I LOVE King's Hawaiian rolls and I didn't realize they had BBQ sauce! I will have to try to hunt it down where I live. We love Hawaiian rolls. For our little one's birthday, we did Hawaiian ham sliders, it was a hit with kids! Oh my goodness, I was JUST saying I want to try making mango salsa. Totally meant to be, lol. I love King Hawaiian rolls. Actually just had them tonight for an impromptu slider meal lol. Was going to have enchiladas, but I apparently got rid of my tortilla wraps... Ended up making enchilada sliders lol. Yum. These look and sound so good. My family loves burgers. I bet these would be a big hit with everyone in my house. What a great meal idea for summer. My kids love burgers so this would be a hit with them. I think I will have to try this recipe this weekend! THose rolls are our favorite! Looks like a delicious eat. I do love patties. Your tutorial was great too. I would like to do it someday in our house.